The development will help clinicians to optimize post-stroke therapy by stimulating brain neurons and taking into account each patient's individual situation. The results of the study were published in Mathematical Biosciences. Over 15 million people have strokes each year. A stroke is an acute blood circulation failure in the brain that kills neural cells. Patients who suffer a stroke often face partial or total speech loss, and find it difficult to move their limbs or the whole body. One rehabilitation method after a stroke is cerebral cortex stimulation with brain-implanted electrodes or magnetic impulses. The success of the therapy depends on many factors, including the area of the brain that is stimulated and the types of signals used. Currently, optimal therapy parameters are selected manually. RUDN mathematicians have created a theoretical model to base such selection on exact calculations. "Our task was to develop a theoretical model describing how the speed of a nervous impact propagation (i.e. the excitation of the tissue) fades down due to post-stroke damage to the cerebral cortex. Moreover, we demonstrated that in certain cases electric stimulation of the brain may compensate for this process," said Vitaly Volpert, the author of the article, and the head of the laboratory of mathematical modeling in biomedicine at RUDN. After a stroke, a so-called penumbra forms in the brain. It is an area where the blood supply is reduced compared to requirements for normal functioning, but which is still higher than the critical level after which an irreversible change occurs. Penumbra cells become less excitable and lose connection with other neurons, leading to changes in the shape and speed of the excitation wave. 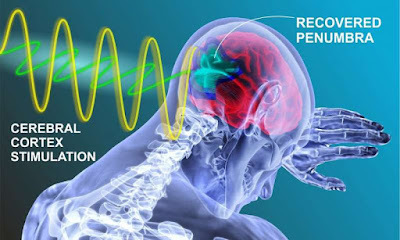 RUDN mathematicians calculated the conditions at which the speed of neural impulses may be restored to normal levels with the help of external stimulation. The model is based on the continual nerve tissue theory. A. Beuter et al. Modeling of post-stroke stimulation of cortical tissue, Mathematical Biosciences (2018).